It’s not like I ever need an excuse to dine out. But I do have a list of restaurants held in reserve for special occasions. My wedding anniversary deserves a top tier restaurant, particularly since we are now at 31 years. Last year’s 30th meant dinner at two phenomenal restaurants- Inn at Little Washington and Chicago’s Alinea. That’s impossible to top. What is perfectly reasonable, however, is double dipping dining. One restaurant the Saturday night before the anniversary, and one the night of the anniversary. Our pick for the weekend before is the brand spanking new Fiola Mare on the Georgetown Waterfront. We are dining with Cousins A & B, whose anniversary falls a few days before ours. We dined with them last year at the Inn, and we decide to pair up for a celebration dinner again this year. We are not necessarily the most perfectly suited dining companions. The cousins are not adventurous eaters, and B is watching his diet. (As I claim to be, but anniversaries don’t count). I am hoping that Fiola Mare will satisfy my desire to try an exciting new restaurant, while at the same time fulfilling the requirements of A & B.
Fiola Mare is the third DC restaurant from Chef Fabio Trabocchi. We have enjoyed a few special meals of Fiola, and are also fans of the fare at the more casual Casa Luca. Fiola Mare focuses on seafood, and the beautiful waterfront view evokes a Mediterranean seaside experience. The only reservation available at the already-popular spot is at 6:00 pm or 9:00 pm. We choose the early arrival, and benefit from the opportunity to witness the sunset. As the light in the room gradually dims, the atmosphere in the restaurant palpably changes from bright and airy to something more elegant and serious. The beautiful display of fresh seafood perched next to the kitchen tempts me. Do I opt for a simple whole fish, grilled and deboned tableside? Or, should I stick to something that exhibits a bit more culinary flair? Once I glimpse Chef Trabocchi toiling away in the kitchen, it fuels my desire for flair. 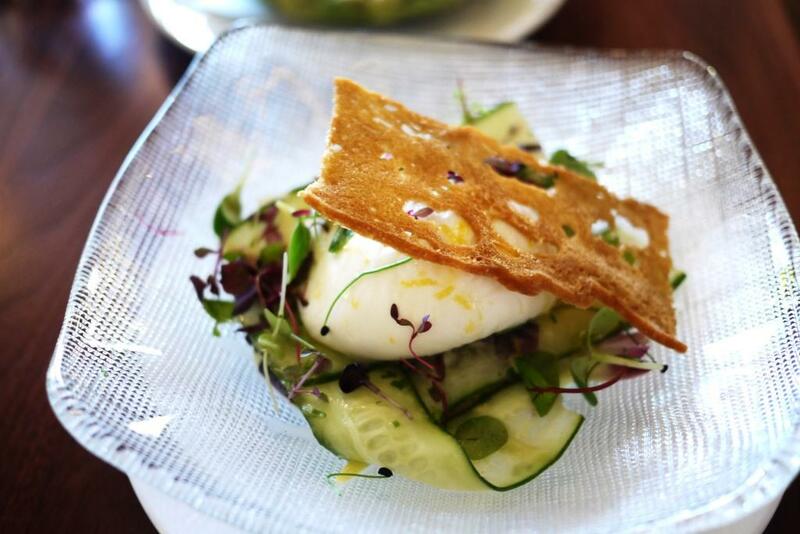 Burrata of buffalo mozzarella rests atop a salad of baby artichokes and cucumber, and basil Genovese pesto. 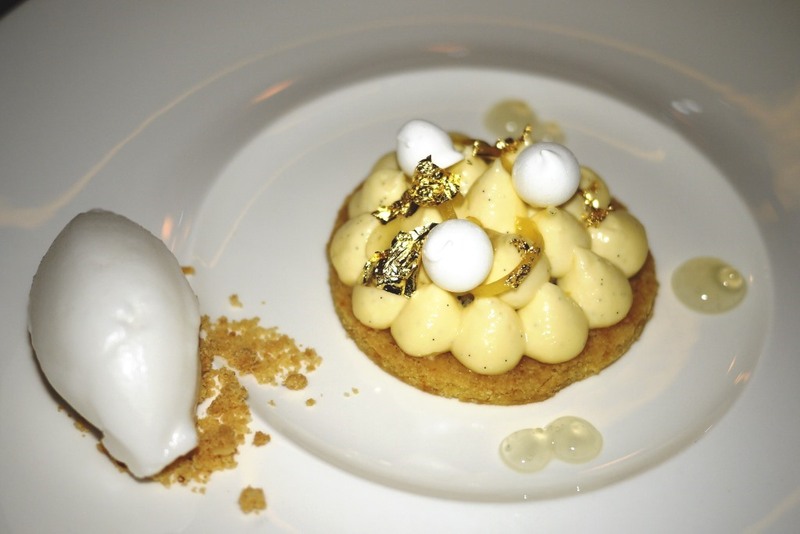 The dish gently eases us into the meal with sophisticated but not over-complicated flavors. 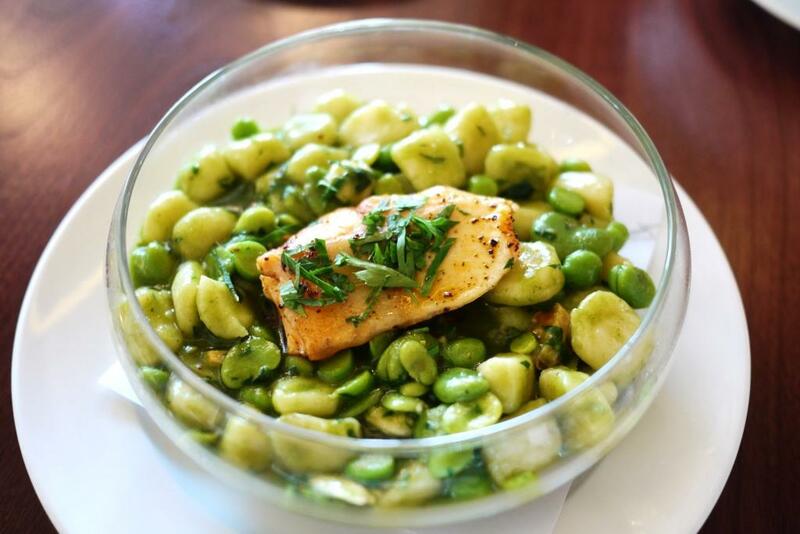 We share smoked potato gnocchi with wild cod, spring peas and fava, dusted with lemon zest and a sprinkle of fresh herbs. The smokiness of the gnocci sends me to the moon. Cousin B isn’t quite as delighted with the intense flavor. I waver on my entree choice. 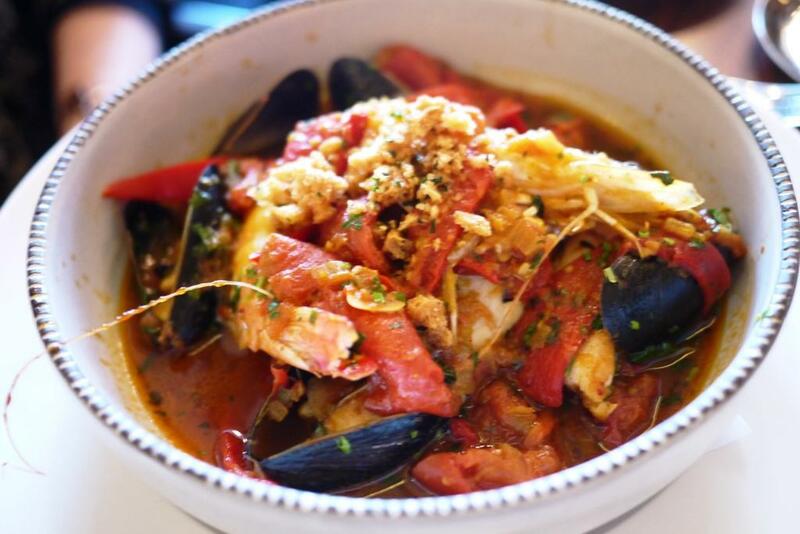 Our server steers me to Adriatic Seafood Brodetto, with her description of the carefully prepared stew that hails from Italy’s Adriatic coast. This is traditionally a dish designed to incorporate leftover pieces of fish. But this mixture of scallops, black cod, calamari, mussels, clams, prawns, and grey mullet is much more deliberate and painstakingly prepared. Each element is cooked separately before being combined into one sumptuously divine dish. At $40, it may be an extravagance, but it’s worth it. 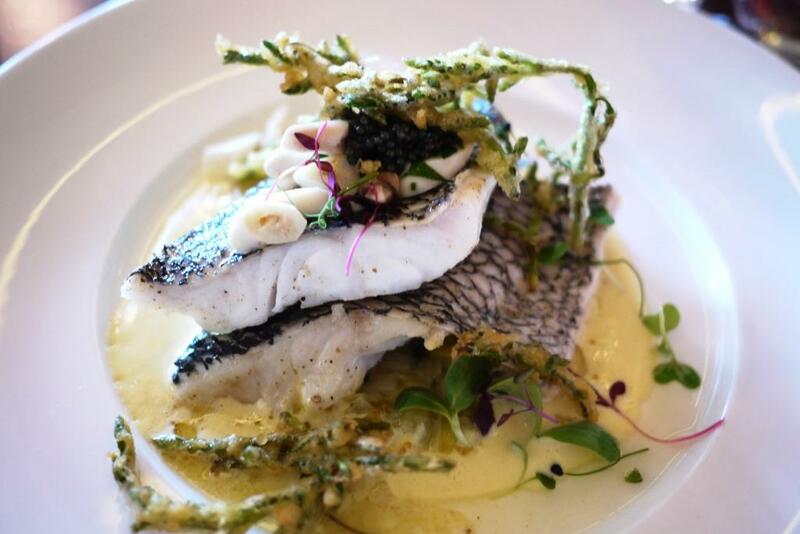 Olive oil poached black bass is a stunner, with melted leeks, spoonbill caviar, and prosecco zabaglione. The dish isn’t just about style. Its flavor lives up to its promising looks. My husband omits the oysters intended for the dish, but the missing element has no apparent effect. 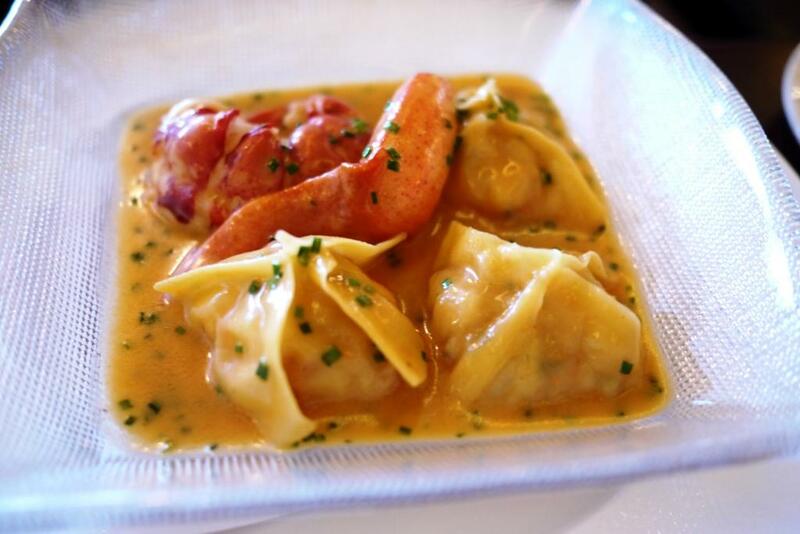 Cousin A enjoys Fiola Maine lobster ravioli, a dish that hearkens back to Trabocchi’s days at Maestro. Although, I am wondering what happened to the foam, which I recall being an integral element to the dish. Cousin B is happy with a wild turbot special, with charred spring onions and olive oil crushed smoked potatoes. He doesn’t care for the potatoes, which incorporates the same smoky flavor as the gnocci. Guess who ate his potatoes? Lucky me. Sautéed spinach and meyer lemon is a worthy companion to our meal, although we’re too stuffed to finish the side. In Tom Sietsema’s Washington Post review, he complains about wordy waiters who want to give a dissertation about the food. His review must have been taken to heart, as we have attentive but somewhat detached service. Our only real complaint is that our entrees are served just moments after we finish our first course. Some breathing room would have been appreciated. Three of us conclude with a trio of gelato. I wish the burnt honey had more flavor. My husband orders torta al limone with lemon curd, yuzu, and coconut sorbet, which is a more fitting ending to the delightful meal. Fiola Mare is the epitome of a special occasion venue, transporting diners from the banks of Georgetown to the captivating Mediterranean seaside. I cannot think of a more appropriate place to celebrate the anniversary of when we consummated our “mare me” proposals.